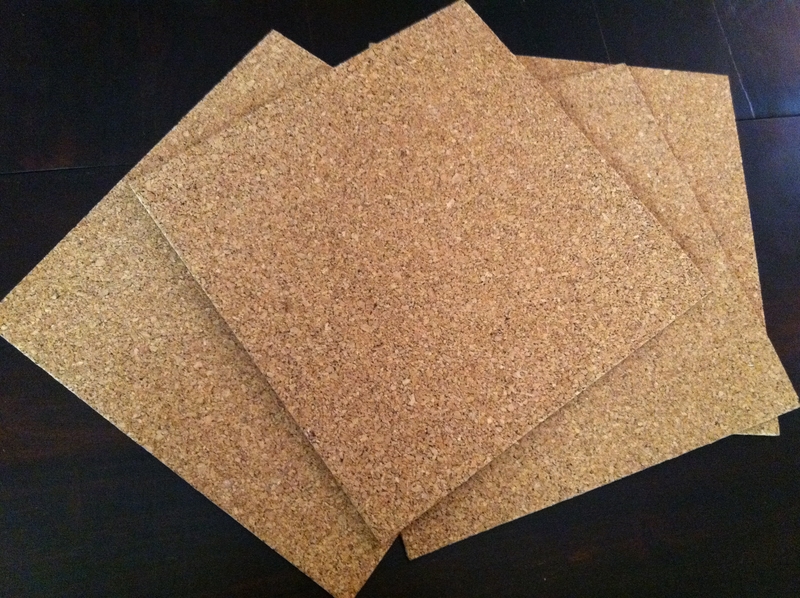 I saw this 4pk of corkboard at Michael’s Arts & Crafts and without being entirely sure of what I would do with it, I bought it (they always get me with that ast minute stuff!). I actually came up with something that I think is super cute and functional, so I had to share it! Check it out. 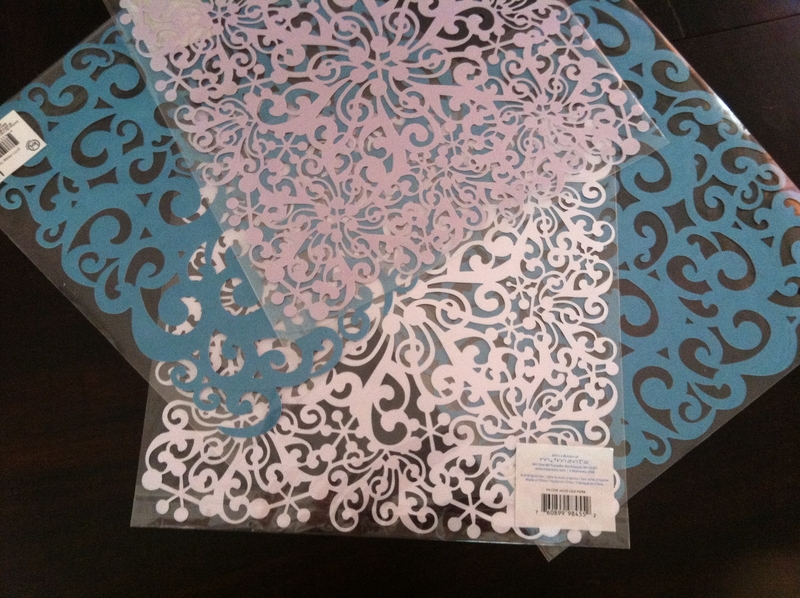 (4) decorative sheets of scrapbook paper 12″ x 12″ I used this “lace” pattern because of the holes, I didn’t want to poke holes through regular paper because it would leave marks. With this paper I can poke around the design. First I layed all the boards out on a flat surface. Then I brushed the back of sheets of scrapbook paper with craft glue. I watered the glue down a little bit so that it wouldn’t clump. Then I layed the sheets directly onto the corkboard. I took another glue wash and brushed it over the surface. Once the glue dried, I sprayed it with a little bit of the Polycrylic Spray. The spray gave the cork boards a nice sheen and got rid of the stickiness from the glue. Then using the adhesive stickers that came with the corkboard, I just hung them up! And there you have a cute & functional corkboard! 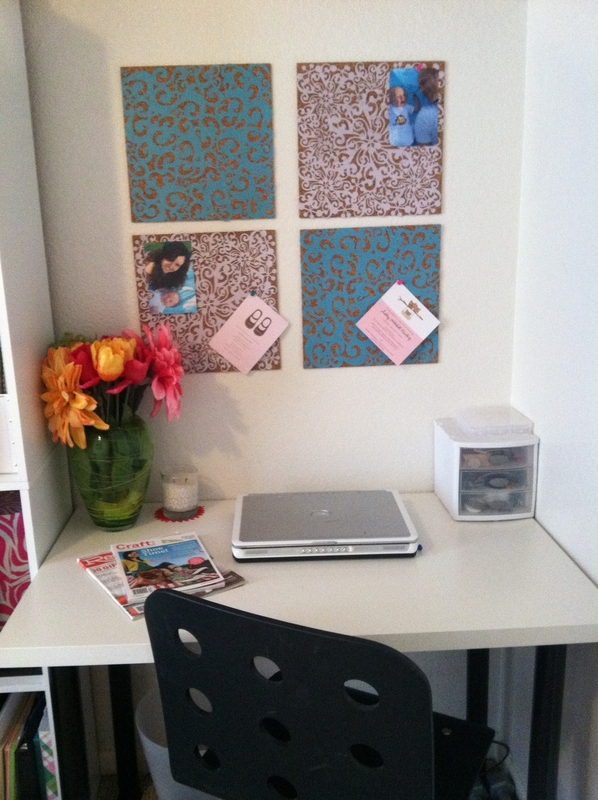 Here’s the before & after of my craft room desk area. This project took me about 20 min and only costs $20.00!!! Whether it's an idea that comes from a friend, or from a local shop, if I like it, I will try to make it. My mission is to pass that inspiration onto others. I will post new projects or craft tips on a weekly basis. I hope you enjoy taking this crafting journey with me and please, if you find something you'd like to make, but don't have the time or energy to try, send it to and maybe I'll make it my next DABBLE. ← What’s New for 2010- Handbags and Greeting Cards!